I was looking right at the real ice cream. It was within reach! But somehow I turned my head at the last second and grabbed the on on the shelf below. How can I ever trust myself again?! I did the same thing with Soy Milk vs Almond Milk in WAL*MART. The 1 litre Tetra® paks of WAL*MART’s brand Soy Milk look exacty like their Almond Milk except for the wording and the Almond Milk was in the same spot on the shelf below. I glanced away, glanced back, and grabbed a box of Almond Milk. Of course, I didn’t realise I’d actually grabbed Soy Milk until I got home. Bleah! A small packet of butter in a foreign country. Turned out to be yeast. Was in the butter section. It depends on the brand. 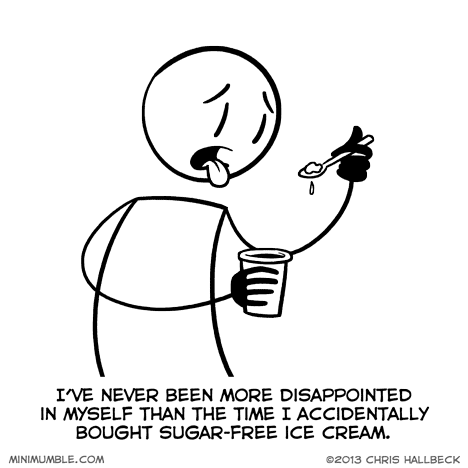 Some sugar-frees are good. You just have to resign yourself to exploration. I don’t care for “Reduced/Low/Non-Fat” products. The texture seems to feel really off to me. Especially crackers and chips. One time my sister thought that this white sauce was sour cream or something like that. When she stuck a spoonful in her mouth, finding that it was hollandaise sauce.